Nob Hill is one of San Francisco’s most elegant neighborhoods, known for its city destinations and the famous hotels that surround Huntington Park. In addition to Nob Hill’s signature style, it also reveals some unexpected facets. 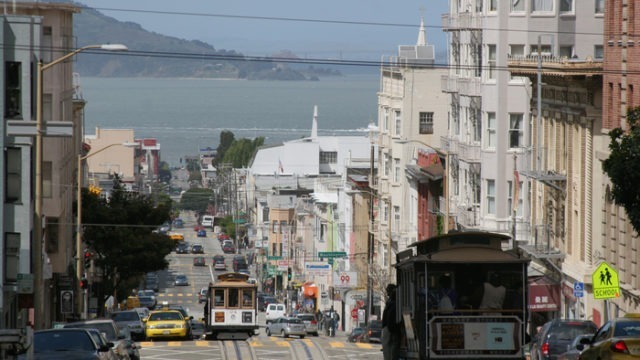 The diverse downtown neighborhood dates back to the Gold Rush times, when cable car lines made the hilltop reachable. Beautiful hotels now stand in the place of the original palaces, and when you walk to the top of the hill, you can see historic buildings including the impressive Fairmont Hotel and the Flood Mansion. The genteel apartment buildings with their unique facades and lush features will make you want to call Nob Hill home forever. If you venture away from Huntington Square, you’ll find tall Chinese temples and quaint businesses spilling over from Chinatown to Union Square. Funky shops, art galleries, and unique dive bars lie along the Tenderloin district (also known as the Tender Nob), and the Polk Street strip is flooded with nightclubs, late-night entertainment, and popular bars. Some parts of San Francisco’s Nob Hill neighborhood are dotted with vintage barber shops, old corner coffee shops, antique stores, and cocktail lounges. Nob Hill is known for its everlasting charm, and it’s home to some of San Francisco’s most iconic stars. Legendary writer Herb Caen lived in the Brocklebank complex across from the Fairmont Hotel, and the famous “San Francisco Twins,” Marian and Vivian Brown, are known to have made Nob Hill their home. In the gorgeous Nob Hill neighborhood, you’ll find heavenly restaurants with mouth-watering meals including the sophisticated New American style Elaine’s, the atmospheric Guava Tree Cafe, the creative Gallery Cafe, and the quaint Nob Hill Cafe. Nob Hill is home to fine dining and a tasteful fusion of cultural cuisines, and it offers the best of the best. San Francisco’s luxurious Nob Hill is full of charming structures and intriguing places to visit. From the historic Cable Car Museum and the evergreen Huntington Park to the inspirational Lumiere Theatre and the countless divine restaurants, Nob Hill has everything you need to call it home. If you’re interesting in buying properties in San Francisco’s Nob Hill neighborhood, contact Pamela Culp at 415.640.3293.